Christmas coming and family visiting have thrown me off my game, and I’ve been slacking on my Tuesday Tips posts lately! So I’m doing one on Thursday instead- it’s my blog and I can do what I want to, right? Anyway- have y’all heard of Influenster? If not, go check them out! This is a great (free!!!) site for people who are connected to social media (ie every single person I know these days) especially bloggers. Influenster is a free-to-join community of trendsetters, social media masterminds, and educated consumers who live to give opinions of products and experiences. But that’s not all. We have a lot going on including digital challenges, twitter parties, & contests! Their VoxBoxes are where it’s at folks. 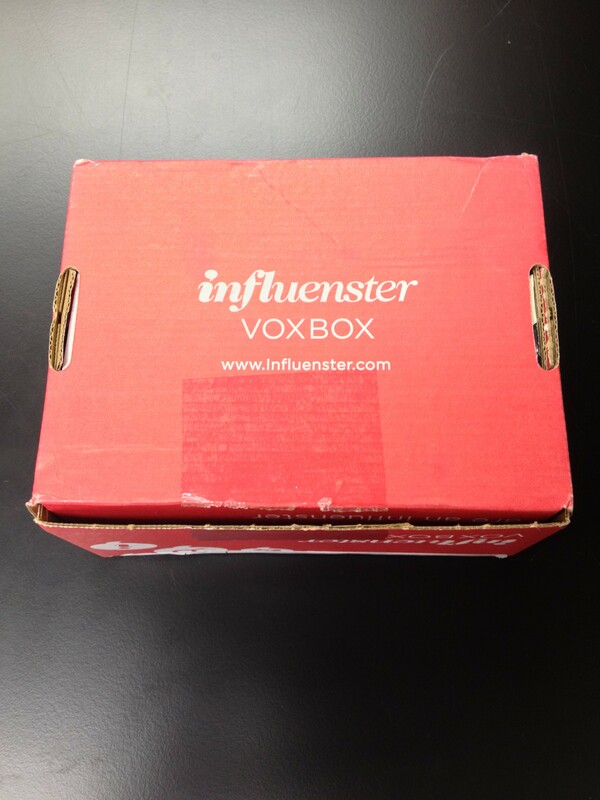 I just received my first one in the mail (the Holly Jolly VoxBox) and it’s awesome!! 1. Puffs Ultra Soft and Strong to go tissue pack– This is great because I have a little tissue pack holder in my car that my sister-in-law made me. It’s currently empty, so this puffs pack is getting put in there pronto! 2. NYC New York Color HD Color Trio Eye Shadow– I don’t wear makeup very often, but the last time I did, I realized that my eye shadow was probably 3 years old. That’s kind of yucky. I’m loving all the colors in this trio (they’re all pretty pink/browns, which is my go-to color for blue eyes- pair that with my current mascara and you’ve got a winning combination for sure, if you don’t mind a few sparkles). There’s a little label over each of the colors to tell you where to put them (highlighter, all over lid, crease) which is an awesome bonus! 4. 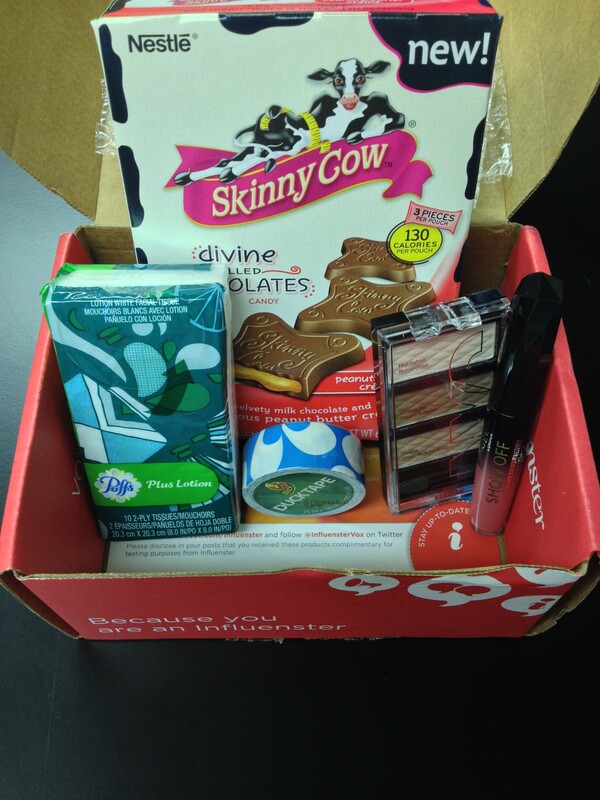 Skinny Cow candy– Ummm, it is sad that I was the most excited about this item? Probably. But a full sized box of chocolate (with peanut butter)?? Yes please! And I won’t feel bad about eating the entire box a whole pouch in one sitting, because there are only 130 calories in the pouch. Yum. 5. Ducklings mini rolls– Aside from the fact that the name of this tape is the cutest thing ever, I’m loving this little roll of tape. It’s super cute and one of my favorite colors (you’ve seen B’s nursery right? He’s probably going to grow up to hate aqua). The walls in my office at work are cinder block and I think this cute roll of tape will be just the trick to put some of our family photos up on display! Pretty awesome right? What are you waiting for- go become an Influenster! !